The AKC itself acknowledged the excellent qualities of German Shepherds. Obedient, Loyal, Family Orientated, Loving dogs. In an AKC feature about German Shepherds, this well respected organization asserted that they are "considered dogdom's finest all purpose workers." "Each year, German Shepherd's are the #1 or #2 top selling Dog"! Top Shepherd Kennel is a Family Owned & Operated professional training & breeding facility specializing in Pure Breed German Shepherds from imported German lines and genetics. Our puppies are Guaranteed healthy Pure Breed German Shepherds. All of our German Shepherd parents and litter's are registered with AKC or German SV. The imported puppies come with their own German Passport, registration with the German SV and will be registered with the AKC. Buy a German Shepherd Puppy to Serve as Your families Best Friend, Family Companion and Protection Dog. Each of our GSD's is an early warning alarm system that is always on and a fully loaded defensive weapon ready and willing to defend their pack! Champion Bloodline's Guaranteed! 100% Approved German Shepherd Puppies For Sale! Buy a German Shepherd Puppy to Serve You as a Protection Dog or Family Companion. Champion Bloodline Guaranteed! The puppies are 3 months old. German Shepherds are generally good with children and well-mannered in the home. German Shepherd is usually an exceptionally obedient dog. Beautiful baby male from direct German imports parents. Wonderful pedigree stock coat. Microchipped and vaccinated with health guarantee. Champion bloodline. Nikita is a stock coat Male German shepherd puppy with Direct import parents. Red and black deep pigments and great personality. Nikita will be microchipped and will have his vaccinations according of age. We also give health guarantee. Nika is Stock coat female German shepherd. Parents are Direct imports with outstanding Champion bloodline pedigree. Red and black with a beautiful deep pigments. Nika is a playful and loving german shepherd, well socialized with small animals and cats. The German Shepherd's Beginning - Shepherd's tending their flocks on the European continent in the 1850's needed a bigger, more intelligent, stronger, completely loyal dog to make protection of the flock and family their primary duty. These dogs needed speed, keen senses, strength and sheer courage in the face of dangerous killers. In In the 1890's Captain Max von Stephanitz started a breeding program to perfect these herding dogs. At a dog show in 1899 he found a dog that completely fulfilled his dreams for the German Shepherd - Hector Linksrhein. Hector was so impressive Captain Max bought him on the spot! Renamed - Horand von Grafrath, Captain Max founded the "Society for the German Shepherd Dog" and Horand was declared to be the 1st true German Shepherd. During WW1 over 20,000 dogs were in service. I is estimated that 50% of these were German Shepherds on both sides of the conflict working for the Red Cross and troops. These dogs sniffed out the enemy, found wounded soldiers, delivered first aid, messages and protected both their handlers and the men in their troop. The German Shepherd excelled in helping wounded soldiers off the field of battle. After the war, this ability lead to the formation of the first Seeing eye dogs. At the beginning of WW2, The US Army Quarter Master established training programs for 32 breeds of dog. By 1944 this list had been reduced to seven and ultimately the German Shepherd dog became the only dog in the K-9 corps. The German Shepherd's now had official roles - They were trained as Sentry Dog's; Scout or Patrol Dog's; Messenger Dog's; or Mine Detection Dogs. Only 3 dogs have a star on the Hollywood Walk of Fame. Two fathom are German Shepherds - Strongheart and Rin Tin Tin. Strongheart was the World's 1st Movie Star Dog, bring audiences to tears as He performed on screen. Rin Tin Tin was rescued from a WW battlefield and became the star attraction of a Saturday morning Kid's show, "The Adventures of Rin Tin Tin". From 1954 thru 1964 166 episodes were produced and Rin Tin Tin's fame spread around the world making Him the most famous German Shepherd of all time. Top Shepherd Kennel - Located in Temecula's Beautiful Wine Country, breeds Quality, Family Companion German Shepherd Dogs (GSD). With over 25 years experience working & trainning these intelligent loving family dogs we can help you find the perfect puppy. Our focus is breeding better GSD's, better genetics and healthier GSD's with direct imports from Germany. 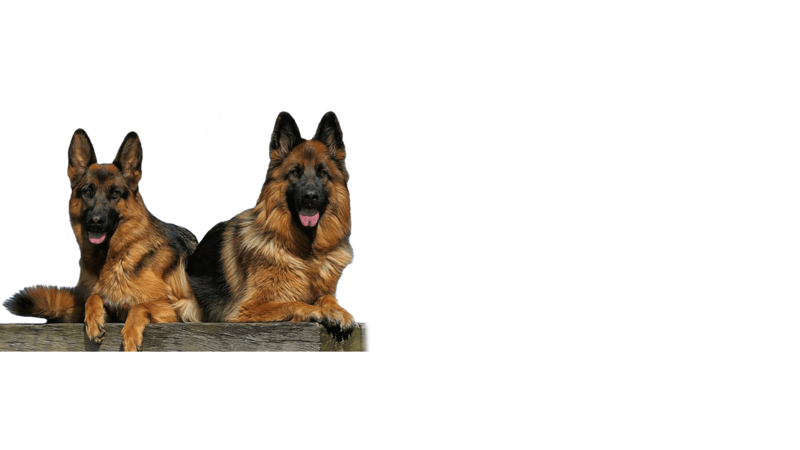 Top Shepherds Kennel has over 25 years experience with German Shepherds. We have won various awards and accolades during this time. This speaks volumes about our dedication to quality, and our focus has been to breed beautiful, healthy, and easily trained dogs. Along this journey, we are also continually improving ourselves with feedbacks from our present and past customers. We got a puppy from here and the owners were very nice and pleasant to work with. My Baron is drop dead gorgeous and we get compliments on him wherever we go. He’s my big baby and I can’t imagine my life without him! Not every human knows how to love a German Shepherd, but every German Shepherd knows how to love a human. Love my boy. Steve and Nataly are amazing and I felt very comfortable with their process. High energy combined with lots of smarts lends itself to disaster when the dog is not properly cared for. It’s imperative that German Shepherds receive appropriate amounts of exercise, special food, bath, care and brain activities. Be caring and responsible. Fitness is not for German Shepherd, so please do not them get lazy right away! Exercise and play! Who let the dogs out? Let everyone in the area know how awesome it is to walk a German Shepherd! Some German Shepherds take a lot of space. Some like it minimal. Get ready for the worst with German Shepherd! These guys love to play! They are friendly and energetic, so please keep them busy! Keep your pup safe from medical emergencies by regular check-ups with your local vet. German Shepherds need special treatment. Here is the list of medicine and vitamins for your pups! Yes, German Shepherds are always hungry. You could never feed them enough. So how to feed German Shepherd?